Church before it was shut down. 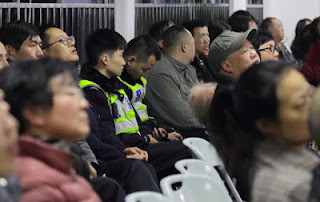 The church sent a prayer request newsletter on January 24 stating that persecution hasn’t de-escalated even as the Spring Festival approaches. Brothers and sisters of the church continue to be jailed. The newsletter said that police had detained Zhang Xiaohong the night before. Multiple Christians involved in the crackdown on Early Rain Covenant Church were arrested by authorities on charges of running illegal businesses because of their work helping the church sell and mail bibles. Christians and churches across the country who purchased books and sermon discs from Early Rain Covenant Church via WeChat were harassed and inspected by the police. Some were taken to the police station for questioning. Among the people arrested because of their connection to Early Rain Covenant Church who have been either under criminal detention or residential surveillance, eight people have been released on bail by January 24, 14 are still under criminal detention and residential surveillance, and five under administrative detention. Early Rain Covenant Church said that multiple brothers and sisters were brought in for questioning. Officers’ questions centered on Pastor Want Yi’s financial situation such as if he had owned a Mercedes-Benz or BMW other than the electric bike he rode.